Lets say you need to extend your Ethernet network to a location 6,000 feet away. Lets assume you have at copper twisted pairs running from point to point. What device will give you a maximum bandwidth connection? A customer with that scenario called today. The Patton 2160 products work over either (1) (2) or (4) twisted pair (or 2, 4, or 8 wires). 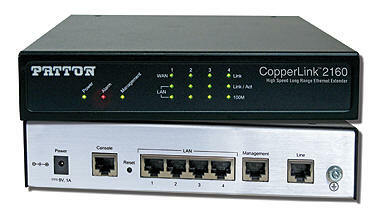 We recommended the Patton 2161 4-wire units which can go the distance with up to 22 Mbps worth of bandwidth. Maybe you have more than one twisted pair from point-to-point…and distances are substantial. Like our customer, you don’t want to run fiber. Well….here ya go. Take a look at the Patton 2160 family of products. For more information call 610-399-3911.